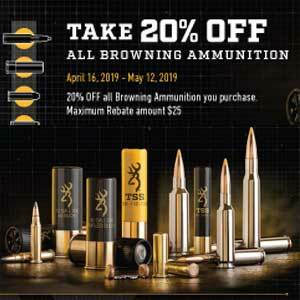 For a limited time, earn 20% back on the purchase of Browning Ammunition ($25 maximum). Offer is valid on qualifying purchases made between April 16, 2019, and May 12, 2019. Offer expires and all requests must be received by May 26, 2019. OFFER IS LIMITED TO ONE OFFER PER HOUSEHOLD. Allow 6 - 8 weeks for delivery. Browning Ammunition is not responsible for lost or stolen mail. Void where taxed, prohibited or restricted by law. Rebate offer valid in the U.S. and Canada. 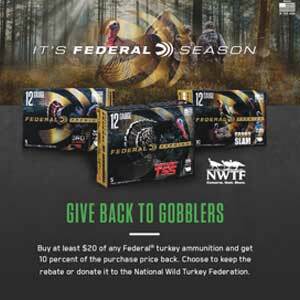 For a limited time, earn $3.00 back for each box of Winchester turkey loads you purchase. Limit one offer per household. Offer is valid on qualifying purchases made between January 15, 2019 and May 31, 2019. Offer expires and all requests must be received by June 15, 2019. Rebate is in the form of a check. Minimum rebate amount: $3.00 (1 box). Maximum rebate amount is $6.00 (2 boxes). 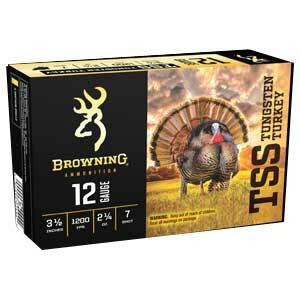 For a limited time, earn a box of Browning TSS Tungsten Turkey Ammo with the purchase of Avian X Decoys or Dave Smith Decoys purchased through Mack’s Prairie Wings. Offer is valid on qualifying purchases made between February 1, 2019 and April 30, 2019. Offer expires and all requests must be received by May 31, 2019. Allow 14 Days for delivery. Mack’s Prairie Wings is not responsible for lost or stolen mail. Void where taxed, prohibited or restricted by law. While supplies last. 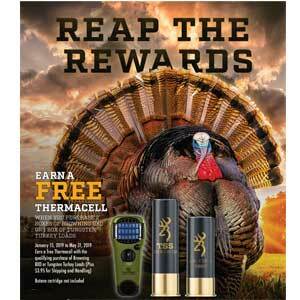 Rebate offer valid in the U.S.
For a limited time, buy two boxes of eligible Browning BXD Turkey or one box of Tungsten Turkey Ammunition, earn a free Thermacell (plus $3.95 for shipping and handling). Offer is valid on qualifying purchases made between January 15, 2019 and May 31, 2019. Offer expires and all requests must be received by June 15, 2019. OFFER IS LIMITED TO ONE OFFER PER HOUSEHOLD. Allow 6 - 8 weeks for delivery. Browning Ammunition is not responsible for lost or stolen mail. Void where taxed, prohibited or restricted by law. 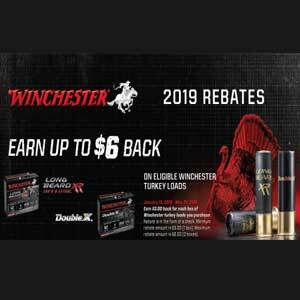 Rebate offer valid in the U.S. and Canada. Minimum spend of $20 required. Maximum rebate limited to $20 per person or household. Purchase must be made between FEB 1, 2019 and MAY 31, 2019, and the rebate form along with required documents must be postmarked by JUN 30, 2019. Consumer must submit rebate form with product UPC barcodes cut from packaging, original cash register receipt and/or dated itemized sales invoice. Please allow approximately 8 to 10 weeks for rebate delivery. CONSUMER REBATE ONLY. CLUBS, GROUPS, ORGANIZATIONS and DEALER entries are VOID and will not be honored, acknowledged or returned. Void where prohibited and subject to all laws. Offer valid for U.S. and Canadian purchases and U.S. and Canadian residents only.